Manila Water joins DepEd’s Oplan Brigada Eskwela | Manila Water Company, Inc.
Photo shows Manila Water employees together with school teachers and volunteers helping repaint and clean the classrooms in San Isidro Elementary School in Cainta Rizal during DepEd’s Brigada Eskwela program. East Zone water and used water service provider Manila Water once again took part in this year’s National Schools Maintenance Week or the “Oplan Brigada Eskwela” of the Department of Education as schools gear up for the influx of students when classes formally open on June 4. 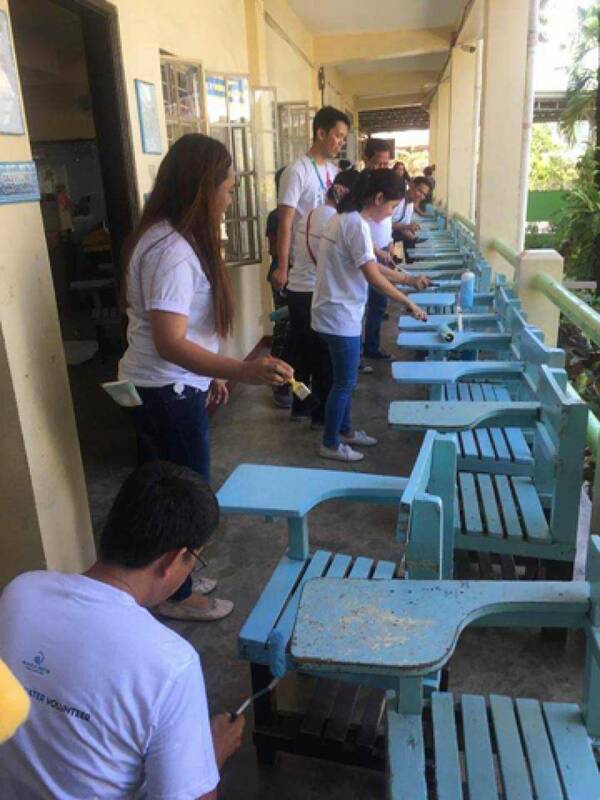 As part of its contribution to the week-long event prior to the school opening, more than a hundred Manila Water employees volunteered to help teachers, volunteers and students clean their classrooms in different public schools in Metro Manila and Rizal Province. Manila Water employees trooped to Villamor High School in Manila, San Isidro Elementary School in Cainta, and Mambugan National High School in Antipolo Rizal where they helped co-volunteers in clean-up activities and at the same time donated cleaning and painting materials. Another batch of Manila Water employees will join Brigada Eskwela in Pasig Elementary School and San Joaquin Elementary School both in Pasig City and Full Mines Elementary School in Quezon City. Manila Water Corporate Strategic Affairs Group Director Jeric Sevilla said that the company ensures that all public elementary schools and high schools located in its concession area enjoy clean and potable water through its Lingap Eskwela project where drinking fountains and wash areas have been installed. Sevilla also added that every year, Manila Water includes the regular desludging or septic tank cleaning as part of its activities in the annual schools’ maintenance program. Project sites adjacent to schools where there are excavations and pipe-laying activities are also cleaned-up and to ease traffic and ensure the safety of students. Manila Water has been an active partner of the DepEd’s Oplan Brigada Eskwela program since it began in 2003.